After a year of other projects, we are now back once a month at one of Scandinavia’s best tiki bars, Brass Monkey in Copenhagen. Fab tiki drinks and a great party crowd! And of course we loved their warm welcome back poster at the entrance! 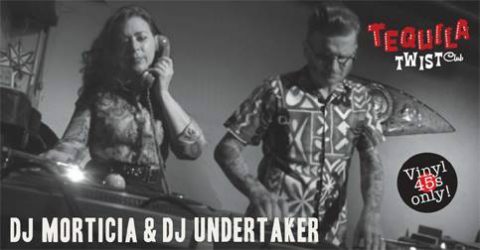 Our winter visit to New York included a couple of gigs with amazing djs Drew Redmond (Midnight offerings, Pin-ball Rock) at the Bootleg Bar and Sheila B. (Sophisticated Boom Boom, WMFU) at the Jupiter Disco, both in Bushwick. Great times in a city where great music is always around the corner! So honoured to have been invited to do a new mix at Buzzsaw Joint, (run by Londonbased dj and collector Fritz Buzzsaw) alongside so many great djs! Of course it is only pure dynamite female artists! Check it out at Mixcloud and please share and comment if you enjoy it! First Copenhagen Soul Weekender, Aug 24-27, went by toooo fast! We are so amazed at the fab crowd that turned up from all over the world, the three talented guys behind the idea (John Berchtold, Ash Pederick – who designed the amazing poster – and Andreas Beraha), and the cool venues the events took place in. A great start for a festival that already got so much soul! We had a blast at this summer’s Voodoo festival in Italy! Lukino Ungawa, our favourite festival magician, managed to throw a great party in a fab location once again. And we had the honour to do a guest appearance at the fun Sunday pool party! Check out our buzzin mix! Hi folks, our new mix, made especially for the amazing Buzzsaw joint, is now out on mixcloud.com! Please give it a listen and tell us what you think on mixcloud. Please share if you like it. Tack!